The formerly fringe natural food show that started 36 years ago now has 3,000 exhibitors and 70,000 attendees; even if you walked the halls with power bar-fueled determination for every second that the show’s open, it’d be near impossible to see even a fraction of the brands. We ate our way through the convention halls, sipping kombucha, sampling adaptogenic teas, chowing down on new yogurt delights, and noshing on salmon bites and watermelon seed butter to bring you the major highlights we experienced first-hand. Here are 8 food scene trends from Expo West that we think are going to be huge—start your shopping lists now…. No pretty way to put this: Meat is coming off the entree plate and getting snack-ified. In other words, Paleo is becoming a prepared food category. Epic Provisions, which stole the show three years ago with its bars of wild, grass-fed bison, continued to be an Expo West darling with its jarred Duck Fat. (Buh-bye ghee?) 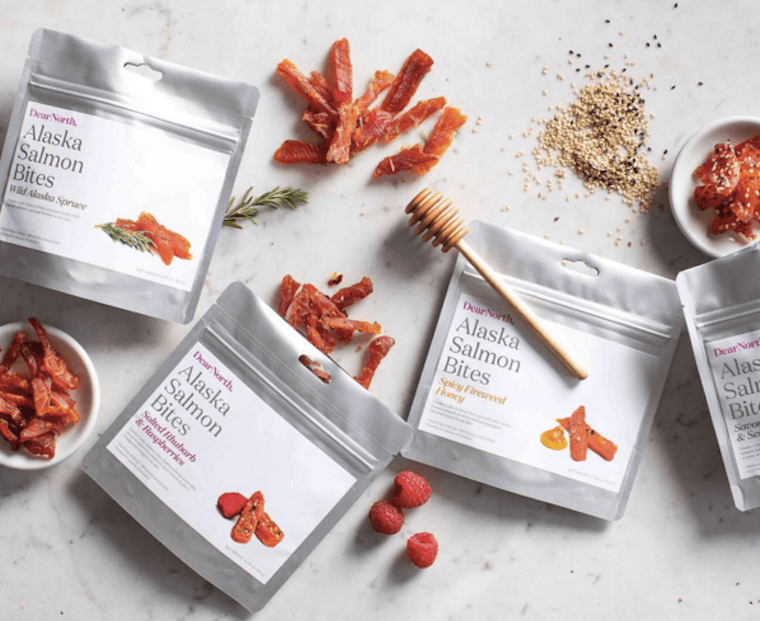 This year, we saw lots of Paleo bar copycats—and salmon swam upstream as an on-the-go protein source and Dear North Alaska Salmon Bites took home the show’s coveted Nexty award. Chobani is launching four savory and spicy Meze Dips to eat with veggies and pita. And hummus is getting a serious culinary upgrade—watch out Sabra and Tribe, it’s going to take more than red peppers and pine nuts to get people excited about hummus in the future. Food Should Taste Good (the healthy chips company) debuted new hummus products with seriously sophisticated flavor profiles and superfood-y ingredients from edamame to black bean—all in a pretty container. From Late July’s whole grain chips in every flavor (including a dead-ringer for Doritos—sans gross factor) to Maya Kaimal chickpea chips to Luke’s Organics red lentil chips, the basic corn chip has some serious competition. We got googly-eyed for the 4-in-1 Vita Juicer from Switzerland. It comes in eight eye-candy colors and has a citrus press, a pulper, and a centrifugal juicer that you can swap in and out, so any fruit or veggie (from a pomegranate to a banana to an avocado to a head of kale) can deliciously end up in a glass. Enthusiasm for probiotics is extending far beyond the pill form. Suja just launched probiotic-infused juices. And Truth Bars offer pre- and probiotics in a convenient—and tasty!—chocolate bar form. In the frozen category, we heart EatPops for finding an affordable, fun new way to sip juice. And their packaging, which features each and every ingredient listed on the front of the wrapper, echoes a trend towards transparency that we saw this year more generally across categories. Isofrut’s freeze dried fruits were surprisingly delicious and useful. They’re a healthier (no added sugar) and more intense tasting alternative to dried fruit (which is actually not much of a health food). No matter what you end up picking up at the supermarket, make sure you take photos of it—according to new research, you’ll enjoy food way more if you Instagram it.